Click HERE to watch the live weather update. Bitter cold will continue through Thursday. Fortunately, no further precipitation is expected until temperatures warm up this weekend. Stay home. Highways are closed, and major roads are ice covered. Driving is next to impossible and it will take you more than double your usual time to reach any destination. If you absolutely MUST drive, maintain a very slow speed, do not accelerate through turns, brake hundreds of feet before stops and only pump brakes, do not lock them. Finally, if you do begin to spin out, release the gas and the break and turn toward the direction of your spin. Again, STAY HOME if possible. 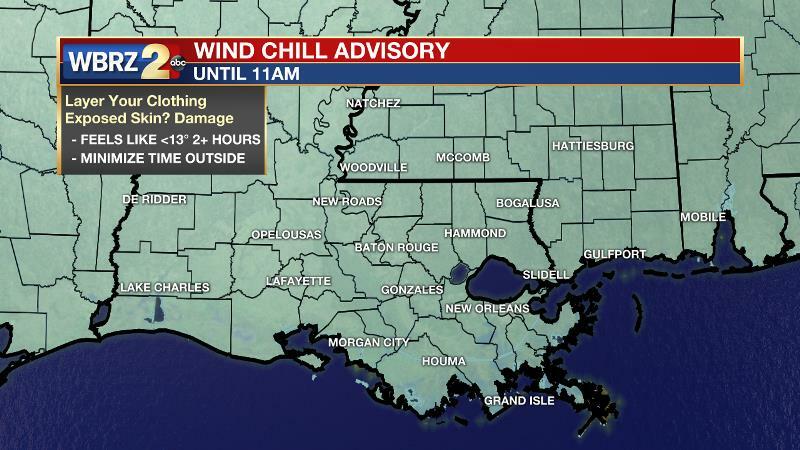 A *WIND CHILL ADVISORY* is in place for the entire forecast area through Wednesday morning. Frostbite and hypothermia can occur in as little as 30 minutes due to feels-like temperatures in the single digits. Wear a hat, gloves, scarf and multiple loose-fitting layers. 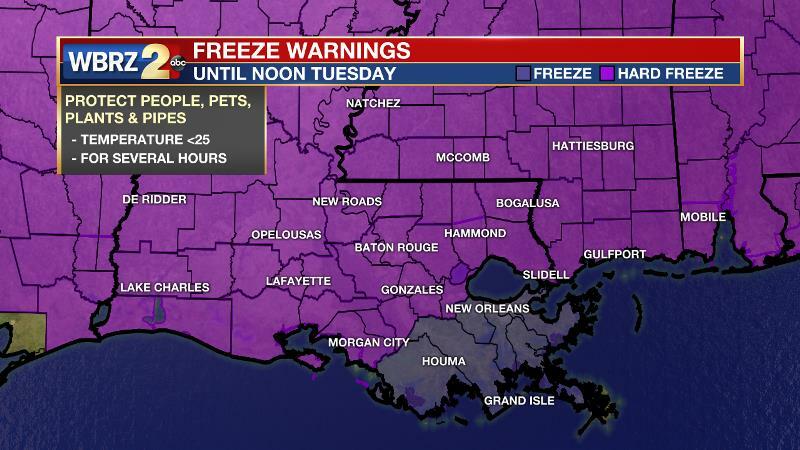 A *HARD FREEZE WARNING* will again be issued from 5pm Wednesday to 11am Thursday. Temperatures are going to fall below 25 degrees for several hours. Have a warm place for people and pets that otherwise do not. Take precautions to prevent pipes from bursting. Today and Tonight: After record cold this morning with temperatures in the mid to upper teens and single digit wind chills, thermometers will struggle to reach the upper 30s, despite full sunshine. A brisk north wind of 5-10mph will maintain feels-like temperatures in the teens and 20s for most of the day. At the same time, that wind in combination with any melting that occurs due to sunlight and the temperature rising above 32 degrees will dry out wet spots, mitigating additional refreezing. The concern is that temperatures will not be above 32 degrees long enough to melt all of the moisture before falling into another hard freeze tonight. Fortunately, winds will ease making the chill factor less of an issue into tomorrow morning. However, it will still be very cold as lows dip down to about 20 degrees again. Up Next: Highs will make into the mid 40s on a sunny Thursday afternoon followed by one more freeze on Friday morning. Unlike the cold stretch in early January though, this spell will be shorter lived, ending after about 48 hours. By Friday, high temperatures will return to the upper 50s. Saturday morning will be above freezing followed by a mostly cloudy afternoon in the upper 60s. On Sunday, thermometers may reach the 70s with a chance of showers and thunderstorms as another cold front moves through in the afternoon and evening. Temperatures will not be nearly as cold on the other side of that one. Strong subsidence and cold air advection will continue through Wednesday night. Clear skies, cold temperatures and very dry air will therefore continue. The heart of the upper level cold pool will park over the forecast area Wednesday preventing high temperatures from escaping the 30s. In fact, thermometers will only go above freezing for a few hours Wednesday afternoon. Some but not complete melting and evaporation is expected. There may be refreezing and slick spots once again tonight into tomorrow. Wind chills will remain in the 20s through the day. Fortunately, wind will decrease Wednesday night and while another hard freeze will occur, the wind chills will not be as severe. A zonal flow in the upper levels will return by Thursday allowing the coldest air to retreat northeast. Temperatures will respond by moderating into the 40s before one more freeze occurs on Friday morning. A weakening shortwave trough will then push across the region on Friday night but due to continued dry air in the low levels of the atmosphere only increased cloudiness is anticipated. Temperature moderation will continue though with Friday highs in the upper 50s followed by above freezing temperatures on Saturday morning and then a high in the upper 60s. The arrival of some low level moisture by Saturday may allow an isolated shower to develop, but that is all. As the lower levels continue to saturate due to warm southerly winds being transported over cooler bodies of water, fog formation will be likely into Sunday morning. Temperatures will continue to warm as deep, southerly winds take hold. Yet another shortwave trough advancing from west to east across there country will lead to positive vorticity advection on Sunday causing the fog to dissipate but also instability to increase. Due to this and an associated cold front, showers and thunderstorms will develop on Sunday afternoon and evening. There may also be enough wind shear available that this environment will need to be monitored for the potential of stronger thunderstorms. Temperature will fall only modestly behind that front with seasonable readings into next week.